← Beware The Wrath Of The Church Organist – Revenge Is Sweet! Today, March 12th, is the 175th anniversary of the first concert given by the then Liverpool Philharmonic Society. Catherine Jones has written a splendid tribute in the Liverpool Echo today, detailing the highs and lows of the Royal Liverpool Philharmonic Orchestra throughout all this time. Some wonderful photos and some video footage. The RLPO celebrates by giving sell-out performances of Beethoven Symphony no. 9 Tonight and Saturday! 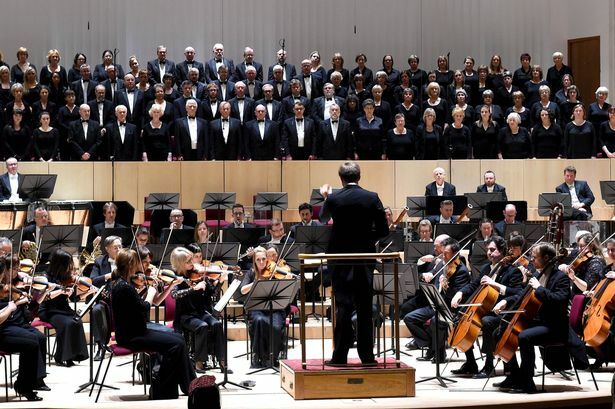 The Royal Liverpool Philharmonic Orchestra and Choir celebrate their 175th anniversary this week with a special sell-out concert at the Philharmonic Hall. And the event marks the exact date – Thursday, March 12 – of the first concert by the Liverpool Philharmonic Society back in 1840. Then, the programme consisted of a series of overtures, madrigals and choruses. This week’s concert features Beethoven’s Ninth Symphony, and Mendelssohn Die erste Walpurgisnacht – also performed at the orchestra’s centenary. Sandra Parr, the Phil’s artistic planning director, says: “This is the end of about three years of planning, and it’s just been incredible looking at all the options we had. And chief conductor Vasily Petrenko adds: “People should expect a big celebration in all aspects. I think there will be excitement – and joy. Ode to Joy! This entry was posted in Uncategorized and tagged "Royal Liverpool Philharmonic Orchestra", 'RLPO', anniversary, Beethoven, birthday, choir, ian, liverpool, nine, no., number, orchestra, parr, Petrenko, philharmonic, rlpc, royal, sandra, symphony, tracey, Vasily. Bookmark the permalink. 2 Responses to Happy 175th Birthday Royal Liverpool Philharmonic Orchestra! A very great day in the musical life of Liverpool, the nation and the world!